WAR MEMORIAL-The plans and illustrations of the proposed memorial were exhibited at a recent meeting in the Jubilee Hall, and were clearly explained by the Chairman (Mr G.F.Davis). It was unanimously agreed that they should be carried out. The actual cost of the memorial to the people would, it was stated, be �0 ,of which � had already been obtained, and it was thought that now the memorial was about to begin, no difficulty would be experienced in getting another �0. The site, at the entrance to the village has been generously given by Mr Ward Coleridge, while Mr T.Spurdle has kindly offered to give up part of his garden as required. The base of the memorial, etc ,is to be the contribution of Captain Davies .Mr Lee, the builder, is going to erect the memorial itself without profit. To all these gentlemen the meeting passed a cordial & unanimous vote of thanks for their kind and valuable contributions. The Rev.F.D. Richardson(Vicar) ,and the Rev.W.Williams (Congregational Pastor) were chosen on the committee in the place of the former Vicar and the former Congregational Minister. The committee will make the necessary arrangements for the whole district to be canvassed for subscriptions. The Chard and IIminster News published this detailed account of the unveiling ceremony and proceedings which took place on Sunday, 11th November, 1923. This was a major occasion, and the newspaper produced a well crafted report. It contains much valuable detail , there being no pictures were available for reproduction- a reminder , if one is needed, of how things have changed over the last century or so. The beautiful memorial to the fallen which the people of Winsham and Cricket St Thomas have been preparing for some considerable time-spurred on by the warm support of Major G.F. Davies of Leigh House, MP for the Yeovil Division of Somerset-was unveiled at an impressive service on Sunday afternoon by Maj.-Gen. Sir Webb Gilman, K.C.M.G.,C.B.,D.S.O., Commander of the Royal Military Academy, Woolwich. Erected at the cross-roads at the entrance to Winsham, the memorial occupies a quadrant of land in the angle formed by the Chard road and that to Ammerham, and takes the form of a Celtic cross' The base is admirably laid outin circular form, being mounted by steps from the Ammerham road side. 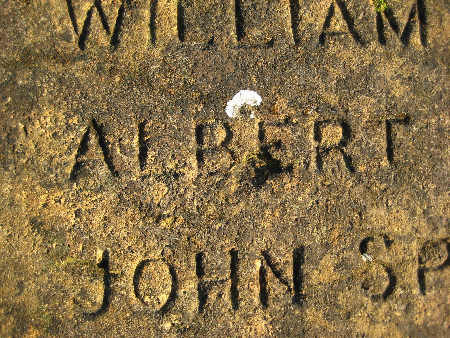 On this rises the weathered octagonal base of the memorial, itself indented with two flights of steps to enable visitors to mount to read the inscription on the shaft The cross is a monolith of Ham Hill stone, carved in low relief on two sides. The wreath characteristic of the Celtic cross is in this case formed of the Crown of Thorns. On the side facing the village appears the inscription: "In memory of the men of Winsham and Cricket St. Thomas who fell in the Great War, 1914-1918"; and on the other side are the lines: "True love by life-True love by death is tried: Live thou for England: We for England died." 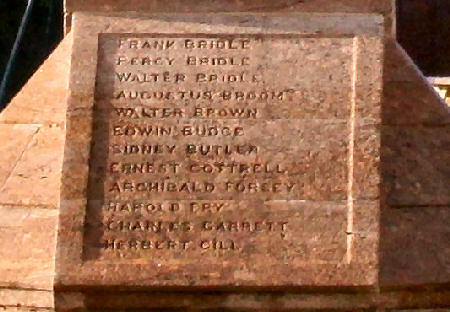 The full Roll of Honour is inscribed as follows:- Frank Bridle, Percy Bridle, Walter Bridle, Augustus Brown, Walter Brown, Edwin Budge, Sidney Butler, Ernest Cottrell, Archibald Forsey, Harold Fry, Charles Garrett, Herbert Gill, William Good, Fred Hawker, Louis Loaring, Wilfred Northcombe, R.N. John Perrott, William Rowe, Albert Russell, John Spurdle, Sidney Spurdle, John Sylvester, John Trott, R.N. James White. 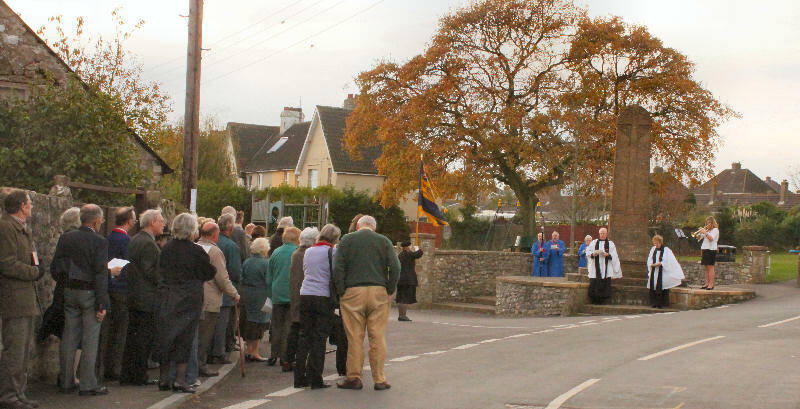 The unveiling ceremony was attended by not only by a representative gathering of inhabitants of the two parishes concerned, but by a large number of visitors from Chard and other places. The Winsham Coronation Band, children from the village school, the Girl Guides under the District Commissioner( MissEdith Langdon) and Captain (Miss Budge), members of the British Legion, War Memorial Committee, headed by Mr T.M. Loaring ( Chairman of Winsham Parish Council), choir, Vicar (Rev. F.D. Richardson), and Congregational minister( Rev.W. Williams) formed in procession outside the Parish Church, and walking to the cross, formed the inner ring of the crowded assembly. The Senior Service was represented by Capt. Warren, R.N., and Chard British Legion by its hon. secretary, Mr. G.W. Stembridge, and several members. The hymns," Fight the good fight" and " O God our help in ages past," were sung, and a short form of dedication service conducted by the Vicar, the lesson from Wisdom iii,1-6, being read by Rev. W.Williams. After the cross had been unveiled and the words of the dedication pronounced by Major-Gen. Gilmar, the Last Post was sounded, and Major Davies spoke briefly from the steps of the cross. "We are net together", he said," to witness the realisation and completion of dreams and plans that have been in the making during the past few years. To-day is Armistice Day, the anniversary of that day five years ago when from Switzerland to the sea the roar of the artillery, the rattle of machine guns, the crack of rifle bullets, which had been incessant for four long years, were suddenly hushed, and a great silence fell on the noise of war. That day and that silence have passed into history and wherever the English language is spoken and an English heart beats, year after year, that silence will be served and thought will go out to the Cenotaph in Whitehall and to the grave of the Unknown Soldier in Westminster Abbey. "But we are not only celebrating Armistice Day here in Winsham. To-day we are dedicating our own memorial to those men of Winsham and Cricket St. Thomas who gave their lives in the Great War. You will remember that first when I came to live among you three and a half years ago, one of the first things I did was to interest myself in the erection of a War Memorial, and now after all that time we see it completed.
" In too many places the erection of a war memorial has been the cause of friction between people of different religions and other opinions, but here in Winsham I think we can congratulate ourselves that the whole village has been at one in the matter. We have to thank many kind friends whose practical assistance has enabled us to erect a memorial not unworthy of what it stands for. "First, I would mention Mr Ward Coleridge , K.C., who made a free gift of the land on which this memorial stands. Then Mr Spurdle who surrendered his tenant rights to it; then Messrs Bird & Bird, the firm of London Solicitors whogave their services and , finally Messrs Alexander Poole & Co., in the person of Mr Lee, who erected the memorial at cost without any profit to themselves. I also wish to pay tribute to the architect, Mr Streatfield , who has designed such an artistic monument. And I wish, in the name of you all, to take this opportunity of publicly thanking them for their valued help and assistance. "There are some here who cannot but think of this occasion with grief and sorrow in their hearts, and there may be others who will say :'To what good was this sacrifice?' To such I would say: 'What does it profit a man to gain the whole world and lose his own soul?' Obedience to the call of duty is greater than a vain attempt to live for oneself alone. And for us that remain to carry on their work, while we may not be called upon to die for our country, yet we have the harder task to live for our country. At a time like this when we are faced with problems without and within such as we have never had to deal with before, it is the duty of each one of us to do our share in helping to find the right solution to these problems. Live thou for England: We for England died'." Wreaths and other floral tributes for placing at the foot of the memorial were at the close of the service received by members of the British Legion. The Legion itself was represented by a wreath of laurel and Flanders poppies, while other flowers were from the War Memorial Committee and Parish Council, The Winsham Football Club, Leigh House, Cricket House, Forde Abbey , and various relatives of the fallen. A clear and sunny afternoon favoured the ceremony. Despite the passage of many years it seems that the relevance of the War Memorial remains. Those who had any experience of the Great War have passed on, and very few of those who fought in World War II remain. But the abomination of war stays with us. Many armed conflicts have taken place involving British forces since the end of World War II, although they have not claimed the lives of any Winsham people. During this first decade of the twenty first century the wars in Iraq and Afghanistan have had a special impact. The electronic media has meant that pictures of the conflicts are seen in the home on a daily basis, along with the sad scenes of the repatriation of the bodies of our young people who have been killed. Every November, Remembrance Sunday is a big national event focussed on the Cenotaph in London. Viewed on national television this ceremony is mirrored in many cities, towns and villages throughout the United Kingdom. Winsham is no exception. 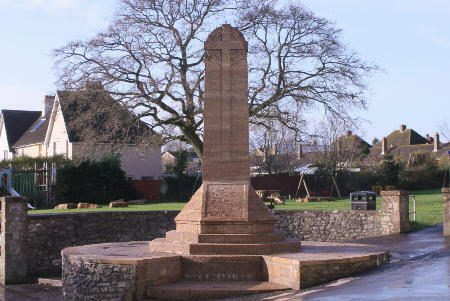 The War Memorial stands at the centre of the village where four roads meet. When the site was selected it was the obvious place for it to be situated. In recent years, with the growth in the number of large and very large vehicles passing through the village it has been damaged several times. Fortunately the central memorial column has not been struck, but the plinth upon which it stands requires frequent and often costly repair. Less dramatic but just as important, atmospheric pollution and the ravages of weather have also left their mark. In view of this the Parish Council decided in 2011 that the memorial should be cleaned . Just cleaned, using high pressure hot water-no chemicals!